Dear Multisport-Athletes! I’m Lisa Teichert, you’ve probably read my name somewhere or seen my face in a quadrathlon-picture or report. I’m competing in Quadrathlon for some years now. Quadrathlon is a small sport unknown by many. 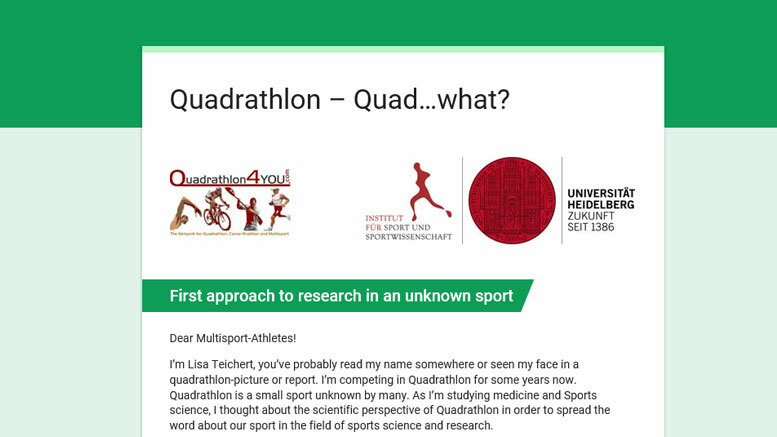 As I’m studying medicine and Sports science, I thought about the scientific perspective of Quadrathlon in order to spread the word about our sport in the field of sports science and research. 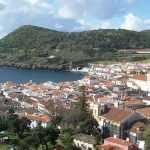 Because Quadrathlon is not as popular as triathlon or football, there have not been conducted any studies yet. So I’m taking the first steps. That is why I aim to gather some information about the athletes competing in Quadrathlons: Who are the Quadrathletes, how do they train, which characteristics lead to international success? You are a quadrathlete yourself. Whether you are successful or not, whether you are old or young, competing or just training the four disciplines, please contribute to the development of our sport by filling in the following questionnaire. I need YOUR answers!! Liebe Multisport-Athleten! Ich bin Lisa Teichert, Du hast vielleicht schon mal meinen Namen in einer Startliste gelesen oder mein Bild in einem Quadrathlon-Bericht gesehen. Ich betreibe den Quadrathlon Sport nun seit einigen Jahren. Quadrathlon ist eine kleine Sportart, die viele nicht kennen. Als Ärztin und Sportwissenschaft-Studentin, dachte ich bereits öfter an die wissenschaftliche Beleuchtung des Quadrathlon, um die Ergebnisse über unseren Sport auf dem Gebiet der Sportwissenschaft und der Forschung zu verbreiten. Weil Quadrathlon nicht so populär ist wie Triathlon oder gar Fußball, existieren aktuell noch keine Studien dazu. So werde ich die ersten Schritte gehen. Deshalb möchte ich einige Informationen über die im Quadrathlon antretenden Athleten sammeln: Wer sind die Quadrathleten, wie trainieren sie, welche Eigenschaften führen zu internationalen Erfolgen? Du betreibst selbst Quadrathlon!? Egal ob Du erfolgreich bist oder nicht, egal ob Du alt oder jung bist, egal ob Du an Wettkämpfen teilnimmst oder einfach nur die vier Sportarten trainierst, bitte unterstütze die Entwicklung von unserem Sport durch das Ausfüllen des folgenden Fragebogens. Ich brauche DEINE Antworten! 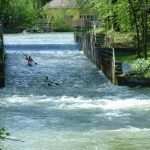 Kedves Multisport-versenyző! Lisa Teichert vagyok, valószínűleg már találkozott a nevemmel vagy a képemmel a quadrathlon versenyekről szóló beszámolókban. Pár éve versenyzem quadrathlon sportágban. 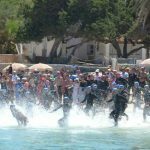 A quadrathlon egy kis sportág, sokak által nem is ismert. 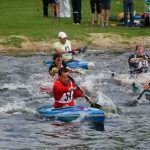 Jelenleg orvosi és sport tudományágban végzem tanulmányaimat és arra gondoltam, hogy a quadrathlon tudományos hátterét fogom kutatni annak érdekében, hogy ezáltal is szélesebb körben megismertessem ezt a sportágat. 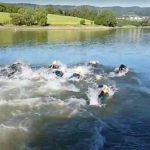 Mivel a quadrathlon nem olyan népszerű sportág, mint például a triatlon vagy a labdarúgás, ezért még nem készült rola tanulmány. Így én teszem meg az első lépéseket ebbe az irányban és információkat gyűjtök azokról a versenyzőkről akik quadrathlon sportágban versenyeznek: Kik ők, hogyan edzenek, mivel jellemezhetők a nemzetközileg sikeres sportolók? Ön is egy quadrathlon sportoló. Akár sikeres, akár nem, akár fiatal, akár nem, akár csak edzéseken űzi a négy sportágat, kérem járuljon hozzá ennek a kérdőívnek a kitöltésével a sportág fejlődéséhez. Szükség van a válaszaira! Be the first to comment on "Quadrathlon – Quad…what?"